Do you judge a wine by its labeled grapes? In a recent cogitation of mine, I lamented how we poor, poor Millennials don't have enough money to purchase the wines we want to drink. But what do we want to drink? Affordability, sustainability, authenticity ... those are the buzzwords often used to catch Millennials' attention. Is it simpler than that? Seasoned wine consumers know the difference between a Chardonnay and a Sauvignon Blanc, or a Cabernet Sauvignon and a Pinot Noir; they know the basic flavors, aromas and textures they can expect from a bottle of these wines, and can base their purchase on that expectation and their preferences. But these grape names may not mean anything to some wine drinkers: How useful are they if you don't know that Cabernet is full-bodied and tannic and Pinot Noir quite the opposite? The latest Millennial wine on my radar gave me pause for just this reason. WineSociety is a new brand launching this month with a flagship red, white and rosé in sleekly designed 500ml cans. The founders, Angela and Austin Allison, had been traveling back and forth between Ohio and California for a few years and noticed that there wasn't much of a wine culture in the former—most of their Millennial friends would reach for beer or cocktails instead. Both wine lovers, they decided to bridge that gap and find a way to get younger drinkers interested and engaged in wine. Here we were thinking varietally labeled wines were demystifying to novices intimidated by the appellation webs of the Old World. Was even that overthinking it? "We don't overtly talk about all the grapes that are involved in the blend itself," said Collin Cooney, a marketing director at The Wine Group in charge of the Big House Wine Co. brand, which makes a Bootlegger White and Prohibition Red. Red blends in particular, most notably those coming from California, have seen a boom in recent years, both in volume and diversity, as Wine Spectator sister publication Market Watch reports. In years past, blends might have been identified as a Cabernet-Merlot or Shiraz-Grenache; now they bear names like Apothic's "Dark" or "Crush" and Ménage à Trois' "Silk" and "Midnight" that hint at a style. These popular brands, in the $15 and under range, have developed a solid Millennial customer base. 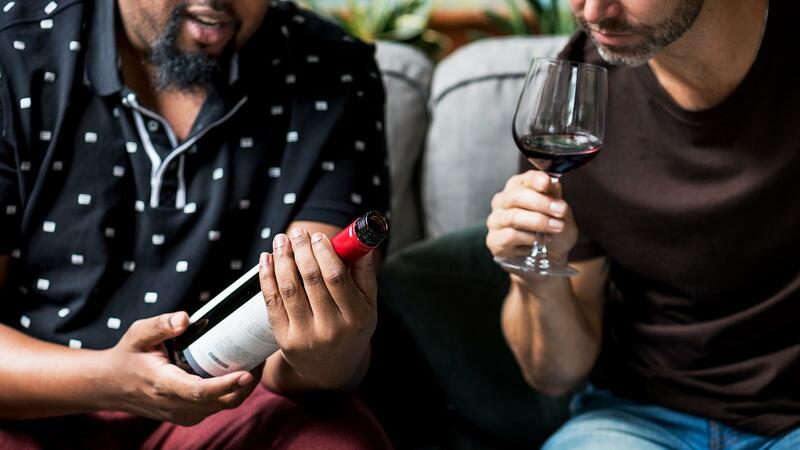 At a higher price point, and possibly attracting the older and more affluent subset of the generation, are wines like The Prisoner and Orin Swift's California reds, Machete and Abstract, which take a similar approach of not putting the grapes front and center. "[It] allows us the freedom to not be constrained by a single varietal, affording us the opportunity to make the best wine possible and maintain consistency from vintage to vintage," said Orin Swift winemaker Dave Phinney, who launched both brands before selling them, respectively, to Constellation and E. & J. Gallo, who have been expanding them. Phinney believes that while young wine drinkers do want to know the grapes, their focus is more on the quality of the wine, and that they're always willing to try new things. Millennials' flexibility is also manifested in the types of blends we see on the market today. Traditional blends like Cabernet with Merlot and Syrah with Grenache (which are legally mandated in many Old World appellations) are now competing with new "kitchen sink" blends that mix varieties unconventionally. Why not? The WineSociety white, for example, is a blend of Albariño and Chardonnay. For Millennials, the exploration and discovery around wine does not have to be married to varieties or tradition. Categories like rosé and sparkling wine have experienced similarly massive growth and innovation, and neither is marketed by what grape varieties are in them. What's important: Is it sweet or dry, and is it pink? So something else may be attracting Millennials to a brand—like the branding. The Prohibition and Bootlegger blends, as the names suggest, hark back to that rebellious era where all consumers wanted was to be able to drink, says Cooney, who adds: "People love to not just hear stories but learn about history." The wine labels feature Al Capone and Charles "Lucky" Luciano. Orin Swift and The Prisoner, meanwhile, catch attention with labels that are bold, edgy and unconventional. The type A wine geek in me is thinking: "But how do I know what this is going to taste like if I'm not paying attention to what the grapes are?" But these brands are evocative and have personality—one that whoever created them is hoping conveys what's in the bottle, enough for young wine drinkers to buy it. And if they like the juice, great. If they don't? They'll move on to the next new thing. I'm in between Millennial and Generation X. Even when I was younger though, I was always interested in what was in the glass. I have no problem with kitchen sink blends. Some can be very fascinating to explore. However at the same time, I want more information, not less. It doesn't need to be front and center on the front of the label, but I want as many details about the wine as possible. For me, the more details the better. I find the details intriguing. I want to know the varietals, vineyards, vintage, harvest dates, harvest method, how the wine was made, what was the vintage like, etc. At the very least, every wine should include a QR code on the back of the bottle that links to a website with all the details for those of us interested in them. People that aren't interested can simply ignore them. I would also argue that Millennials are doing themselves a bit of a disservice by completely ignoring varietal. Go ahead and find blends that you like, but then go and learn more about those blends. Once you learn what is in them, that may help steer you towards other blends you might like or even help steer you towards individual varietals outside of blends that you like. The more you learn, the better off you will be in the long run. Don't lock yourself in to only drinking a particular blend or style of blend. You'll be missing out on an awful lot if you do. Ultimately the wine needs to get sold, and producers/suppliers will adjust accordingly or go out of business. Marketeers, and other industry pundits will need to devote some time in to identifying if there is indeed a game changing trend afoot that will cause a stampede from the traditional wine market of us older vintages to the modern wine family. It's difficult to grasp that one generation growing up in the modern electronic age can choose such a radical path from the one taken for so many centuries, and dramatically change a traditional industry at lightning speed.